Auriga Machinery India Pvt. Ltd. is widely admired organization that since 2005, has been engaged in engineering top-quality machines and robotic equipment which have crucial application in Construction & Mining industries. As a distinguished Service Provider, Exporter, Supplier and Manufacturer of Hydraulic Rock Breaker simple in design, robust in structure, inexpensive & efficient in performance, moreover having great capacity and providing varied output with optimum. We have also been an approved pan India Distributor of OK Tec, supplying a large variety of Hydraulic Rock Breaker, Hydraulic Buster, Demolition Hammers, Concrete Cutter which are adaptable to a various range of uses and ensure several advantages in application and characteristics of the finished products. So as to be a leading name of the market and serving Indian & International clientele, we consistently do research for effecting innovation and development in our product line. Our earnest dedication is to assure that our series of Hydraulic Rock Breaker should be technologically sophisticated and ergonomically designed. Our client-satisfaction induced strategy and world-class service to customers, in addition to custom- designing the machines in line with specification and application requirement of clients make us the unrivaled leader of the industry. We export our comprehensive range of machines like Hydraulic Rock Breaker to numerous countries, as well as import robotic equipment from China, Korea, New Zealand, Italy, so that we can offer cover-all solution to the rock breaking & cutting operation in Material Handling, Mining & Construction industries. Shear: Alligator Shear, Baler Shear, Wood Shear, Rail Shear, steel shear, Concrete Shear etc. Our series of qualitative machines have gained a worldwide accreditation because of its international standards, longer functional life and high performance. 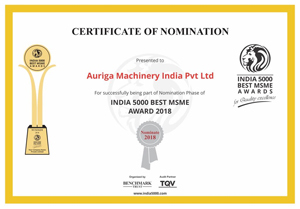 Auriga Machinery India Pvt. Ltd. is comprised of a team of technocrats having rich expertise of the industry. Our experts either for production or services are specialized in their relevant areas, so offer our clients with complimentary installation assistance and on-site training. They also impart regular training courses, product certification and service contracts. In addition, we also offer retrofitting, overhauling and service contacts on all distributed products which can be availed across any corner of the globe in no time. We have a large production and service team that comprises technical and professional workforce that has intensive knowledge and domain skill in manufacturing and service of Hydraulic Rock Breaker and allied machinery. Our professionals like engineers, technicians, quality controllers, research associates and sales personnel. It is noted that our exclusive team of quality-management analysts who are directly accountable for conducting test and validation operation on the structure, design and performance of the machines which optimally function and operate, while offering an excellent throughput. We also provide training to clients how to operate and make the optimum use of machines and robots. As a result, we have been expanding our business base and achieving the higher growth.